Hip Holiday Happy Hour - Tonight! Friends! After many years of fiddling around with thoughts of how to sell my work online, I am pleased to announce that my ETSY shop is open! What is ETSY, you ask? 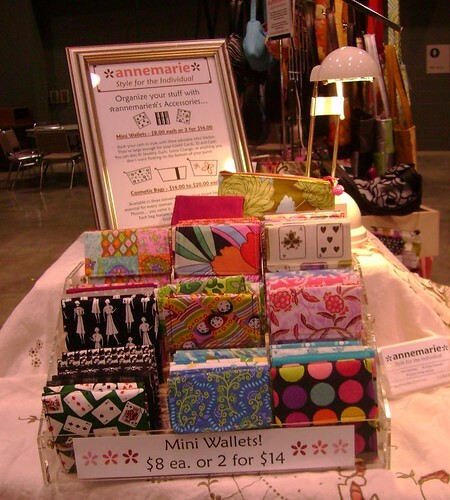 Well, it's a really fabulous site where you can create your own store online for just a small fee. Each item gets up to 5 photos, and once you figure it all out, it's quite easy to use. 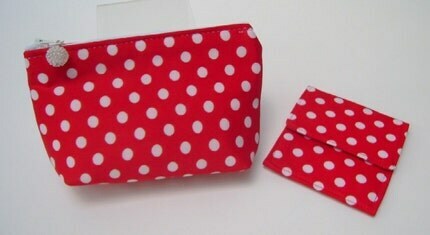 For starters I have posted LOTS of Mini Wallets, several Cosmetic Bags, and a few Gift Sets. The Holiday Shopping season is officially here (duh, as of last week)... but if you're anything like me, you avoid the crowds at all costs. 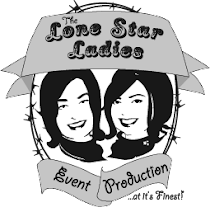 Super fun shows just around the corner - check out all the links at left, and look for a special blog on that early tomorrow. Keep your fingers crossed for me that Yahoo lets my email out of "Spam hawk"!!! So friends, I am the first to admit I am a bit behind in internet stuff. I like to use free services - this blog is free, I have free email addresses, etc... Well you get what you pay for! Normally for events, I send out an Evite (free!) I love Evite because I can send up to 500 people an invitation in one click. Yet today, I needed to send more of a "newsletter" - an invitation to 3 separate shows I have coming up. I actually sat and manually entered in 450 email addresses into my new yahoo email account, carefully separating them into groups of 50. Then I sent each group my newsletter. Then my account was deactivated. I guess you get what you pay for. I counted on yahoo to provide me with a free and secure and fair service. Now I have spent the past hour searching for a way to actually contact a human at Yahoo to reactivate my account. Lesson learned. I'm going to have to become a paying member of the web, and purchase access to my own email server and perhaps use some service to send out newsletters. Just what I need before a weekend full of shows - a tense neck from the stress of wondering if I will EVER get my email address back? A word to the wise - if you have important info transmitted by email - do NOT use a free service. I can just hear my Dad saying "well, you should've known better..."
So, a few weeks ago I wrote a blog about my friend and fabulous jewelry designer - Courtney Husak. So it's finally over - the biggest show of my year, Stitch. 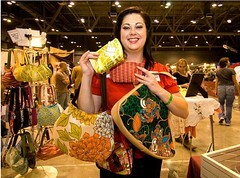 This year the show was fun as always - lots of shoppers, tons of fabulous vendors from all over the US, and I had a great time. At left is a (somewhat grainy) picture of me from the Alist! Section of the Austin 360 website. Click here to see a LOT more pictures! Photograph is by David Weaver. I was super proud of my new banner - I wish I had been able to hang it up higher - but I trust it will be used for many shows to come! 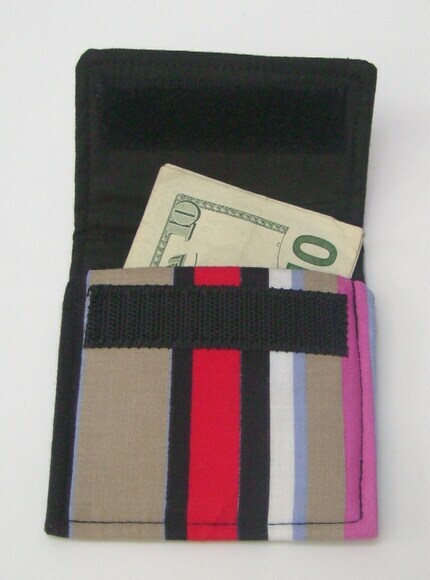 Here is a shot of my most popular product - the Mini Wallet! I have sold thousands of these in Austin, and lots of people at Stitch sought me out to find them. 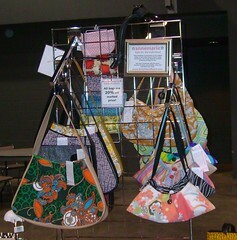 I could never have made so many without my fabulous assistant, Kat! 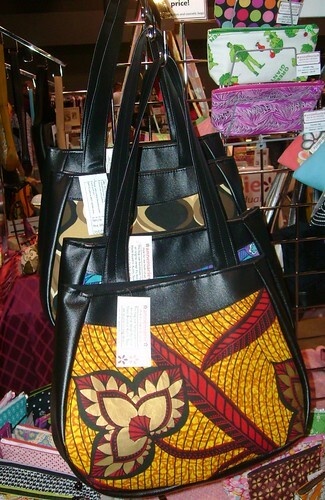 Lastly - a shot of my newest bag style - the Lily - she is curvy and very large indeed! As always, the show was very well produced and I met a lot of vendors who I will be featuring on my blog in the weeks to come. 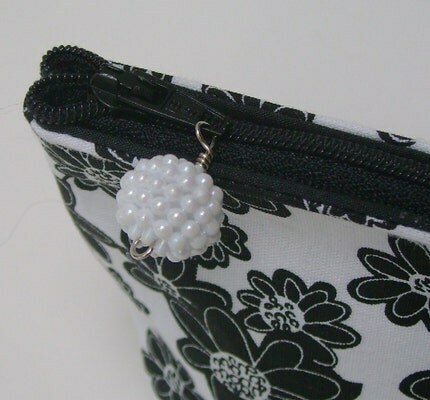 Right now I am hard at work on getting my Etsy shop open in time for the holidays!